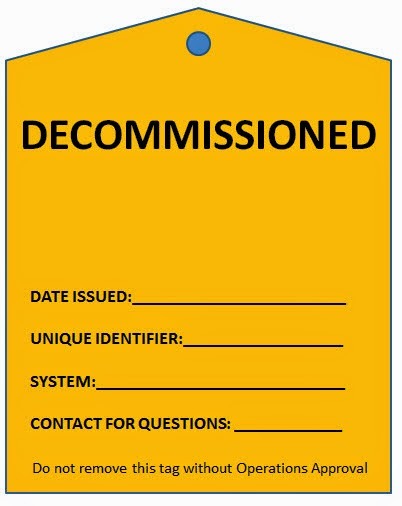 In my global travels while performing inspections of power plants, factories and other critical infrastructure I often see equipment that is "decommissioned." It is understandable that the cost of removing large, heavy equipment is expensive; however, I have often wondered aloud why the factory managers do not tag or identify the equipment as decommissioned. One idea I've proposed is to place a large hot orange/hot pink tag on the decommissioned equipment so that personnel will recognize its status. Even the occasional auditor or inspector may even declare it as a "Good Practice." "Even though a machine may no longer be active in the production process, this does not mean that the machine has been rendered hazard free..."
I heartily agree with JP and wished I had his article handy during my previous inspections where I've highlighted concerns about decommissioned equipment and the hazards posed. The plant or factory management needs to recognize the risks with these "turned off pieces of equipment" and mitigation actions taken. Thanks to J. P. Titus for the brief article and thanks for giving more support for my arguements that decommissioned equipment is not a trivial issue.